The Society has its own Research Room located within the historic National Justice Museum, High Pavement, Nottingham. Details of opening times are also available on the Notice Board and Events calendar. Access is free for members and £2 per session for non members. Everyone welcome. Volunteers are always on hand to help. 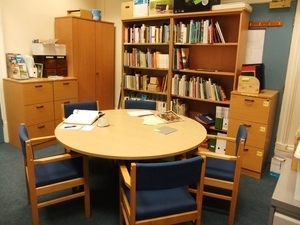 The Research Room contains the Society’s extensive and growing collection of books and published material as well as data on fiche and CD. Some of this data is unique to the Society such as its ground breaking Record Series of booklets. The Society has transcribed most of the Church of England baptism and burial registers of Nottinghamshire and has also produced an index of marriages. There are also recent copies of Your Family Tree and the Family Tree magazines available. Internet access is available to researchers, and several sites useful for genealogical research have been pre bookmarked. Library – a collection of books and pamphlets covering a wide variety of subjects from basic guides, to specifics such as militaria, as well as items on local history, maps etc. There is also a small collection of items relating to our neighbouring counties of Lincolnshire, Leicestershire, Derbyshire and Yorkshire. Record Series – Series of booklets produced by the Society covering a wide range of topics specific to Nottinghamshire. The Notts FHS were the first to surname index ALL county census returns prior to general internet access. Currently the majority of the series is out of print but the Society are in the process of transferring several books to CD or onto a searchable database format. The Society Baptism, Marriage and Burial databases for Nottinghamshire. Memorial Inscription databases including two of the large Nottingham cemeteries. Society Journal – A complete set of the quarterly journal. Much of this data will be unique to the society as it has been submitted by members across the world. Pedigrees and Birth Briefs – data submitted by members. Includes printed and hand written material. IGI – Birth, baptism and marriage data compiled from parish records in Britain and Scotland. Complete set available on microfiche. Exchange Journals – Notts FHS exchanges its Journal with many other FH Societies across the world. These are available to view in the library.